Boy Crazy Cabins. I really fell in love with this perfect boy color fabrics. 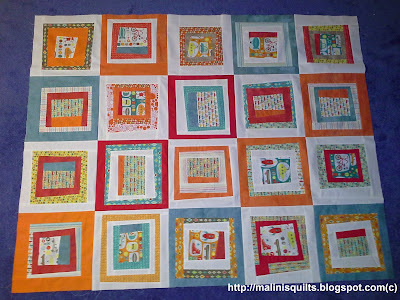 And have been wanting to make a wonky log cabin quilt for a long time now. So, this was just perfect. So, head on over to Riley Blake Designs to checkout my tutorial. Last week I showed you a peek of all the HTS I was making. 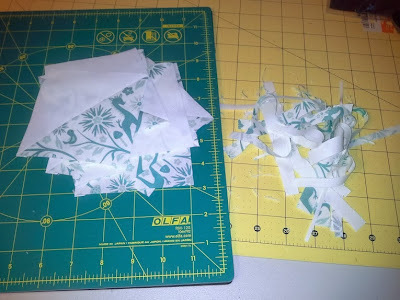 I am using striping piecing to make these HTS and its so much fun. Probably will have to do a tutorial sometime. I quilted this quilt with feathers FMQ and free-motion straight line designs called "Dot to Dot Quilting" by Angela Walters. I loved this class, but there are mixed reviews about this since Angela demonstrates this on the DSM. But she is just awesome as always. I rented the longarm at Bits-N-Pieces to quilt this and I was pretty happy with how my feathers turned out. Definitely a great improvement from last time. For me, still long arm quilting experience is surprise every time I go there. Sometimes my quilting turns out the way I expected and sometimes it doesn't. Now linking up Lee's W.I.P. Wednesday @FreshlyPiecied blog. W.I.P. Wednesday - Something cute! Something cute is cooking up in my studio today. I will have more pictures to share this Friday. Aren't those dreamy deers cute! or are they unicorns? Now linking up to Lee's freshly pieced blog. Welcome to our 2nd day of a very special blog hop - "Just for the Boys". My project involves a very special little buddy of mine, my son who is 2 yrs old. A while ago he took over his big sisters doll stroller, now he completely owns it. We slowly take over big sister's stuff....first borrow it and then never return. It becomes ours ;)...LOL. He is very tiny and so sometimes he can make himself comfortable in this toy stroller. He loves puppies and always carries his little puppy & blankie around. 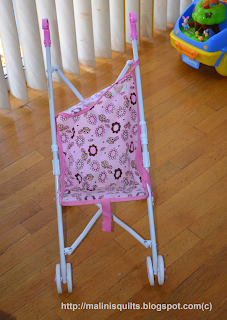 So I decide to make a stroller cover using some of my favorite puppy fabrics - "Spot's Favorite Color". For the back of the stroller I did a wonky modern log cabin block and for the seat I just used a square fabric trimmed to half circle. I quilted in the ditch for both the back and the seat. Some of my other projects from the past which are oriented towards special boys in my life.